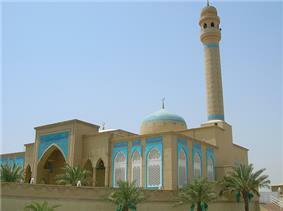 Kuwait (Arabic: دولة الكويت‎ ), officially the State of Kuwait, is a country in Western Asia. Situated in the northern edge of Eastern Arabia at the tip of the Persian Gulf, it shares borders with Iraq and Saudi Arabia. As of 2014, Kuwait has a population of 4.1 million people; 1.2 million are Kuwaitis and 2.8 million are expatriates. In the eighteenth and nineteenth centuries, Kuwait was a prosperous trade port. Starting in the early 20th century, its regional economic importance declined, and by 1934 Kuwait had lost its prominence in long-distance trade. Kuwait's economy was devastated by several trade blockades, starting with the British Empire's blockade during World War I. Following the Kuwait-Najd War of 1919–20, Saudi Arabia imposed a trade blockade against the country from 1923 until 1937. Kuwait is a constitutional emirate with a high income economy backed by the world's sixth largest oil reserves. The Kuwaiti dinar is the highest valued currency in the world. The country ranks highly in regional comparisons of protection of civil liberties, press freedom and constitutionalism. In recent years, political instability has hindered the country's economic diversification. During the Persian siege of Basra in 1775–79, Iraqi merchants took refuge in Kuwait and were partly instrumental in the expansion of Kuwait's boat-building and trading activities. As a result, Kuwait's maritime commerce boomed. Between the years 1775 and 1779, the Indian trade routes with Baghdad, Aleppo, Smyrna and Constantinople were diverted to Kuwait. The East India Company was diverted to Kuwait in 1792. The East India Company secured the sea routes between Kuwait, India and the east coasts of Africa. After the Persians withdrew from Basra in 1779, Kuwait continued to attract trade away from Basra. Kuwait was the center of boat building in the Persian Gulf region. During the late eighteenth and nineteenth centuries, vessels made in Kuwait carried the bulk of trade between the ports of India, East Africa and the Red Sea. Kuwaiti ship vessels were renowned throughout the Indian Ocean. Regional geopolitical turbulence helped foster economic prosperity in Kuwait in the second half of the 18th century. Kuwait became prosperous due to Basra's instability in the late 18th century. In the late 18th century, Kuwait partly functioned as a haven for Basra's merchants fleeing Ottoman government persecution. According to Palgrave, Kuwaitis developed a reputation as the best sailors in the Persian Gulf. During the reign of Mubarak Al-Sabah, Kuwait was dubbed the "Marseilles of the Gulf" because its economic vitality attracted a large variety of people. In the early 20th century, Kuwait immensely declined in regional economic importance, mainly due to many trade blockades and the world economic depression. Before Mary Bruins Allison visited Kuwait in 1934, Kuwait lost its prominence in long distance trade. During World War I, the British Empire imposed a trade blockade against Kuwait because Kuwait's ruler supported the Ottoman Empire. The British economic blockade heavily damaged Kuwait's economy. The Great Depression negatively impacted Kuwait's economy starting in the late 1920s. International trading was one of Kuwait's main sources of income before oil. Kuwaiti merchants were mostly intermediary merchants. As a result of European decline of demand for goods from India and Africa, the economy of Kuwait suffered. The decline in international trade resulted in an increase in gold smuggling by Kuwaiti ships to India. Some Kuwaiti merchant families became rich due to gold smuggling to India. Kuwait's pearling industry also collapsed as a result of the worldwide economic depression. At its height, Kuwait's pearling industry led the world's luxury market, regularly sending out between 750 and 800 ship vessels to meet the European elite's need for pearls. During the economic depression, luxuries like pearls were in little demand. The Japanese invention of cultured pearls also contributed to the collapse of Kuwait's pearling industry. Following the Kuwait–Najd War of 1919–20, Ibn Saud imposed a trade blockade against Kuwait from the years 1923 until 1937. The goal of the Saudi economic and military attacks on Kuwait was to annex as much of Kuwait's territory as possible. At the Uqair conference in 1922, the boundaries of Kuwait and Najd were set. Kuwait had no representative at the Uqair conference. Ibn Saud persuaded Sir Percy Cox to give him two-thirds of Kuwait's territory. More than half of Kuwait was lost due to Uqair. After the Uqair conference, Kuwait was still subjected to a Saudi economic blockade and intermittent Saudi raiding. Poverty has settled in Kuwait more heavily since my last visit five years ago, both by sea, where the pearl trade continues to decline, and by land, where the blockade established by Saudi Arabia now harms the merchants. Some merchant families left Kuwait in the early 1930s due to the prevalence of economic hardship. At the time of the discovery of oil in 1937, most of Kuwait's inhabitants were impoverished. From 1946 to 1982, Kuwait experienced a period of prosperity driven by oil and its liberal atmosphere. In popular discourse, the years between 1946 and 1982 are referred to as the "Golden Era". In 1950, a major public-work programme began to enable Kuwaitis to enjoy a modern standard of living. By 1952, the country became the largest oil exporter in the Persian Gulf region. This massive growth attracted many foreign workers, especially from Palestine, Egypt and India. In June 1961, Kuwait became independent with the end of the British protectorate and the sheikh Abdullah Al-Salim Al-Sabah became an Emir. Under the terms of the newly drafted constitution, Kuwait held its first parliamentary elections in 1963. Kuwait was the first Gulf country to establish a constitution and parliament. In the 1960s and 1970s, Kuwait was the most developed country in the region. Kuwait was the pioneer in the Middle East in diversifying its earnings away from oil exports. The Kuwait Investment Authority is the world's first sovereign wealth fund. From the 1970s onward, Kuwait scored highest of all Arab countries on the Human Development Index. Kuwait University was established in 1966. Kuwait's theatre industry was well-known throughout the Arab world. In the 1960s and 1970s, Kuwait's press was described as one of the freest in the world. Kuwait was the pioneer in the literary renaissance in the Arab region. In 1958, Al Arabi magazine was first published, the magazine went on to become the most popular magazine in the Arab world. Many Arab writers moved to Kuwait because they enjoyed greater freedom of expression than elsewhere in the Arab world. The Iraqi poet Ahmed Matar left Iraq in the 1970s to take refuge in the more liberal environment of Kuwait. Kuwaiti society embraced liberal and Western attitudes throughout the 1960s and 1970s. Most Kuwaiti women did not wear the hijab in the 1960s and 1970s. At Kuwait University, mini-skirts were more common than the hijab. In the early 1980s, Kuwait experienced a major economic crisis after the Souk Al-Manakh stock market crash and decrease in oil price. During the Iran-Iraq war, Kuwait supported Iraq. Throughout the 1980s, there were several terror attacks in Kuwait, including the 1983 Kuwait bombings, hijacking of several Kuwait Airways planes and attempted assassination of Emir Jaber in 1985. Kuwait was a regional hub of science and technology in the 1960s and 1970s up until the early 1980s, the scientific research sector significantly suffered due to the terror attacks. Oil fires in Kuwait in 1991, which were a result of the scorched earth policy of Iraqi military forces retreating from Kuwait. After the Iran-Iraq war ended, Kuwait declined an Iraqi request to forgive its US$65 billion debt. An economic rivalry between the two countries ensued after Kuwait increased its oil production by 40 percent. Tensions between the two countries increased further in July 1990, after Iraq complained to OPEC claiming that Kuwait was stealing its oil from a field near the border by slant drilling of the Rumaila field. In August 1990, Iraqi forces invaded and annexed Kuwait. After a series of failed diplomatic negotiations, the United States led a coalition to remove the Iraqi forces from Kuwait, in what became known as the Gulf War. On 26 February 1991, the coalition succeeded in driving out the Iraqi forces. 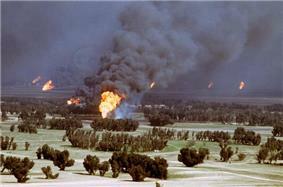 As they retreated, Iraqi forces carried out a scorched earth policy by setting oil wells on fire. During the Iraqi occupation, more than 1,000 Kuwaiti civilians were killed. In addition, more than 600 Kuwaitis went missing during Iraq's occupation, approximately 375 remains were found in mass graves in Iraq. In March 2003, Kuwait became the springboard for the US-led invasion of Iraq. Upon the death of the Emir Jaber, in January 2006, Saad Al-Sabah succeeded him but was removed nine days later by the Kuwaiti parliament due to his ailing health. Sabah Al-Sabah was sworn in as Emir. In 2011–2012, there were protests calling for reforms. The parliament was dissolved in December 2011 due to protests against the parliament. The prime minister stepped down following protests. In June 2015, a suicide bombing took place at a Shia mosque. It was the largest terror attack in Kuwait's history. Kuwait is a constitutional emirate with a semi-democratic political system. The Emir is the head of state. The hybrid political system is divided between an elected parliament and appointed government (dominated by the ruling family). The Constitution of Kuwait was promulgated in 1962. Kuwait is among the Middle East's freest countries in civil liberties and political rights. Freedom House rates the country as "Partly Free" in the Freedom in the World survey. Kuwait is the only Gulf state that is ranked "partly free". 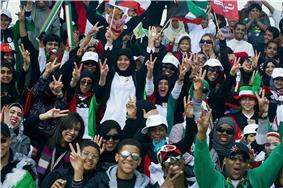 Human rights in Kuwait has been the subject of criticism, particularly regarding migrant workers rights and the Bedoon. Expatriates account for 70% of Kuwait's total population. The kafala system leaves migrant workers prone to exploitation. Human rights organizations have criticized Kuwait for failing to protect foreign workers from exploitation. Kuwait's media is annually classified as "partly free" in the Freedom of Press survey by Freedom House. Kuwait's media is the freest in the Gulf region. Kuwait consistently ranks as having the freest media in the Arab world. Since 2005, Kuwait has frequently earned the highest ranking of all Arab countries in the annual Press Freedom Index by Reporters Without Borders. In 2009, 2011, 2013 and 2014, Kuwait surpassed Israel as the country with the greatest press freedom in the Middle East. Kuwait is also frequently ranked as the Arab country with the greatest press freedom in Freedom House's annual Freedom of Press survey. Kuwait produces more newspapers and magazines per capita than its neighbors. There are limits to Kuwait's press freedom, criticism of the government and ruling family members is permitted but many people have been jailed for defaming the Emir. 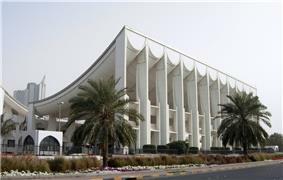 Kuwait's constitution criminalizes criticism of the Emir. Kuwait follows the "civil law system" modeled after the French legal system, Kuwait's legal system is largely secular. Sharia law governs only family law for Muslim residents, non-Muslims in Kuwait have a secular family law. For the application of family law, there are three separate court sections: Sunni, Shia and non-Muslim. According to the United Nations, Kuwait's legal system is a mix of British common law, French civil law, Egyptian civil law and Islamic law. The court system in Kuwait is secular. Unlike other Gulf states, Kuwait does not have Sharia courts. Sections of the civil court system administer family law. Kuwait has the most secular commercial law in the Gulf. Foreign affairs relations of Kuwait is handled at the level of the Ministry of Foreign Affairs. The first foreign affairs department bureau was established in 1961. Kuwait became the 111th member state of the United Nations in May 1963. It is a long-standing member of the Arab League and Cooperation Council for the Arab States of the Gulf. Before the Gulf War, Kuwait was the only "pro-Soviet" state in the Gulf. Kuwait acted as a conduit for the Soviets to the other Gulf states and Kuwait was used to demonstrate the benefits of a pro-Soviet stance. Between 1961 and 1991, Kuwait had an uneasy relationship with the United States characterized by mistrust and hostility. In July 1987, Kuwait refused to allow U.S. military bases in its territory. As a result of the Gulf War, Kuwait's relations with the U.S. have improved significantly and currently hosts thousands of US military personnel and contractors within active U.S. facilities. Kuwait is one of America's closest allies in the Middle East and the Arab World. The Military of Kuwait traces its original roots to the Kuwaiti cavalrymen and infantrymen that used to protect Kuwait and its wall since the early 1900s. These cavalrymen and infantrymen formed the defense and security forces in metropolitan areas; charged with protecting outposts outside the wall of Kuwait. The Military of Kuwait consists of several joint defense forces. The governing bodies are the Kuwait Ministry of Defense, the Kuwait Ministry of Interior, the Kuwait National Guard and the Kuwait Fire Service Directorate. The Emir of Kuwait is the commander-in-chief of all defense forces. Kuwait City is located on Kuwait Bay, a natural deep-water harbor. 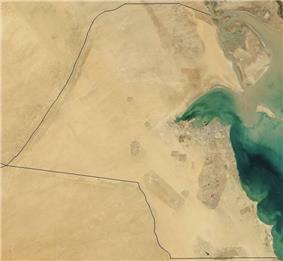 90% of Kuwait's population live within the Kuwait Bay coast. The country is generally low lying, with the highest point being 306 m (1,004 ft) above sea-level. It has nine islands, all of which, with the exception of Failaka Island, are uninhabited. With an area of 860 km2 (330 sq mi), the Bubiyan is the largest island in Kuwait and is connected to the rest of the country by a 2,380 m (7,808 ft) long bridge. Only 0.6% of the land area is considered arable with sparse vegetation found along its 499-kilometre (310 mi) long coastline. Kuwait's Burgan field having a total capacity of approximately 70 billion barrels (1.1×1010 m3) of proven oil reserves. During the 1991 Kuwaiti oil fires, more than 500 oil lakes were created covering a combined surface area of about 35.7 km2 (13.8 sq mi). The resulting soil contamination due to oil and soot accumulation had made eastern and south-eastern parts of Kuwait uninhabitable. Sand and oil residue had reduced large parts of the Kuwaiti desert to semi-asphalt surfaces. The oil spills during the Gulf War also drastically affected Kuwait's marine resources. The spring season in March is warm with occasional thunderstorms. The frequent winds from the northwest are cold in winter and hot in summer. Southeasterly damp winds spring up between July and October; hot and dry south winds prevail in spring and early summer. The shamal, a northwesterly wind common during June and July, causes dramatic sandstorms. The temperature in Kuwait during summer is above 25 °C (77 °F). The highest recorded temperature was 54.4 °C (129.9 °F) which is the highest temperature recorded in Asia. Kuwait is divided into six governorates. The governorates are further subdivided into areas. Al Hamra Tower is the tallest sculpted tower in the world. Kuwait has a petroleum-based economy, petroleum and fertilizers are the main export products. The Kuwaiti dinar is the highest-valued currency unit in the world. Petroleum accounts for nearly half of GDP and 94% of export revenues and government income. The Kuwait Stock Exchange is the second-largest stock exchange in the Arab world. Kuwait was the pioneer in the Middle East in diversifying its earnings away from oil exports. However the country has struggled to diversify its economy since the Gulf War. In recent years, the hostile relationship between the elected parliament and government has prevented the implementation of economic reforms. In the past five years, there has been a significant rise in entrepreneurship and small business start-ups in Kuwait. The informal sector is also on the rise, mainly due to the popularity of Instagram businesses. Many Kuwaiti entrepreneurs are using the Instagram-based business model. The Kuwait Investment Authority (KIA) is Kuwait's sovereign wealth fund specializing in foreign investment. The KIA is the world's oldest sovereign wealth fund. Since 1953, the Kuwaiti government has directed investments into Europe, United States and Asia Pacific. As of 2015, the holdings were valued at $592 billion in assets. Kuwait is the Arab world's largest foreign investor, with $8.4 billion in FDI outflows in 2013. Kuwait consistently tops regional rankings in FDI outflows. In 2013, Kuwait almost tripled its foreign investments. Over the last 10 years, Kuwait has doubled investments in the UK to more than $24 billion. In 2014, Kuwait became the largest foreign investor in China's RMB market. Kuwait's 2014 population was 4.1 million people, of which 1.2 million were Kuwaitis, 1.1 million Arab expatriates, 1.4 million Asian expatriates, and 76,698 Africans. Expatriates account for 70% of Kuwait's total population. 60% of Kuwait's total population is Arab (including Arab expats). Indians and Egyptians are the largest expat communities respectively. Kuwait's official language is Modern Standard Arabic. Kuwaiti Arabic is Kuwait's colloquial dialect. Kuwaiti Sign Language is used by the deaf community. English is widely understood and often used as a business language. Kuwait Towers, the country's most famous landmark. Within the Gulf Arab states, the culture of Kuwait is the closest to the culture of Bahrain; this is evident in the close association between the two states in terms of accents, food, and clothes, in addition to the similar degrees of openness in the two societies. Kuwait is known for its home-grown tradition of theatre. Kuwait is the only country in the Gulf with a theatrical tradition. The theatrical movement in Kuwait constitutes a major part of the country's cultural life. Theatrical activities in Kuwait began in the 1920s when the first spoken dramas were released. Theatre activities are still popular today. Kuwaiti soap operas (المسلسلات الكويتية) are the among the most-watched soap operas in the Arab world. Although usually performed in the Kuwaiti dialect, they have been shown with success as far away as Tunisia. Kuwait has the oldest modern arts movement in the Arabian Peninsula. Beginning in 1936, Kuwait was the first Gulf country to grant scholarships in the arts. The Kuwaiti artist Mojeb al-Dousari was the earliest recognized visual artist in the Gulf region. He is regarded as the founder of portrait art in the region. In 1943, al-Dousari launched Kuwait's first art gallery. Kuwait is home to more than 20 art galleries. The Sultan Gallery was the first art gallery in the Gulf region. Khalifa Al-Qattan was the first Kuwaiti artist to hold a solo artist exhibition in Kuwait. He founded a new art theory in the early 1960s known as "circulism". Kuwait was the pioneer of literary movement in the region. In 1958, Al Arabi magazine was first published, the magazine went on to become the most popular magazine in the Arab world. In the 1970s, writers moved to Kuwait where they enjoyed greater freedom of expression than elsewhere in the Arab world. ^ a b c d e f g "Kuwait". ^ "Population of Kuwait". Kuwait Government Online. 2013. ^ a b c d "IMF Report for Selected Countries and Subjects : Kuwait". ^ "2014 Human Development Report Summary" (PDF). United Nations Development Programme. 2014. pp. 21–25. Retrieved 27 July 2014. ^ "2013 Population Census". Government of Kuwait. 2013. ^ Furlong, Tom (14 April 1991). "The Rocky Road That Faces Many Kuwaiti Merchants". ^ Berkowitz, Peter (11 July 2003). "Democracy in Kuwait". ^ a b c d e f g h i j Tétreault, Mary Ann (1995). The Kuwait Petroleum Corporation and the Economics of the New World Order. Westport, Connecticut: Greenwood Publishing Group. pp. 2–3. ^ a b Lea, David, ed. (2001). A Political Chronology of the Middle East. London: Europa Publications. p. 142. ^ a b c Scudder, Lewis R. (1998). The Arabian Mission's Story: In Search of Abraham's Other Son. Grand Rapids, Michigan: Wm. B. Eerdmans Publishing. p. 104. ^ a b c d e f g Al-Jassar, Mohammad Khalid A. (May 2009). Constancy and Change in Contemporary Kuwait City: The Socio-cultural Dimensions of the Kuwait Courtyard and Diwaniyya (PhD thesis). The University of Wisconsin-Milwaukee. p. 80. ^ a b "10 Most Valuable Currencies in the World". Silicon India. 21 March 2012. ^ a b Ibrahim Ahmed Elbadawi, Atif Abdallah Kubursi. "Kuwaiti Democracy: Illusive or Resilient?" (PDF). ^ a b c "Kuwait". Reporters without Borders. ^ a b c "Kuwait - The New York Times". ^ a b c "Operation Roll Back Kuwaiti Freedom". ^ a b c "Kuwait's Democracy Faces Turbulence". ^ "Political instability halts development projects in Kuwait". CPI Financial. ^ Bladd, Joanne (31 May 2014). "Battling Inertia – Kuwait’s Dilemma Continues". Gulf Business. ^ Al-Jassar, Mohammad Khalid A. (May 2009). Constancy and Change in Contemporary Kuwait City: The Socio-cultural Dimensions of the Kuwait Courtyard and Diwaniyya (PhD thesis). The University of Wisconsin-Milwaukee. p. 64. ^ Bell, Gawain, Sir (1983). Shadows on the Sand: The Memoirs of Sir Gawain Bell. p. 222. ^ "ʻAlam-i Nisvāṉ" 2 (1–2). University of Karachi. 1995. p. 18. Kuwait became an important trading port for import and export of goods from India, Africa and Arabia. ^ a b Al-Jassar, Mohammad Khalid A. (May 2009). Constancy and Change in Contemporary Kuwait City: The Socio-cultural Dimensions of the Kuwait Courtyard and Diwaniyya (PhD thesis). The University of Wisconsin-Milwaukee. p. 66. ^ a b Bennis, Phyllis; Moushabeck, Michel, eds. (1991). Beyond the Storm: A Gulf Crisis Reader. Brooklyn, New York: Olive Branch Press. p. 42. ^ Lauterpacht, Elihu; Greenwood, C. J.; Weller, Marc (1991). The Kuwait Crisis: Basic Documents. Cambridge international documents series, Issue 1. Cambridge, UK: Research Centre for International Law, Cambridge University Press. p. 4. ^ a b Al-Jassar, Mohammad Khalid A. (May 2009). Constancy and Change in Contemporary Kuwait City: The Socio-cultural Dimensions of the Kuwait Courtyard and Diwaniyya (PhD thesis). The University of Wisconsin-Milwaukee. p. 67. ^ Abdullah, Thabit A. J. (2001). Merchants, Mamluks, and Murder: The Political Economy of Trade in Eighteenth-Century Basra. Albany, New York: State University of New York Press. p. 72. ^ Sagher, Mostafa Ahmed. The impact of economic activities on the social and political structures of Kuwait (1896–1946) (PDF) (PhD). Durham, UK: Durham University. p. 108. ^ Sweet, Louise Elizabeth (1970). Peoples and Cultures of the Middle East: Cultural depth and diversity. American Museum of Natural History, Natural History Press. p. 156. The port of Kuwait was then, and is still, the principal dhow-building and trading port of the Persian Gulf, though offering little trade itself. ^ Aggarwal, Jatendra M., ed. (1965). Indian Foreign Affairs. Volume 8. p. 29. ^ Sanger, Richard Harlakenden (1970). The Arabian Peninsula. Books for Libraries Press. p. 150. ^ a b Donaldson, Neil (2008). The Postal Agencies in Eastern Arabia and the Gulf. Lulu.com. p. 93. ^ Al-Jassar, Mohammad Khalid A. Constancy and Change in Contemporary Kuwait City: The Socio-cultural Dimensions of the Kuwait Courtyard and Diwaniyya (PhD thesis). The University of Wisconsin-Milwaukee. p. 68. ^ Hasan, Mohibbul, ed. (2007) [First published 1968]. Waqai-i manazil-i Rum: Tipu Sultan's mission to Constantinople. Delhi, India: Aakar Books. p. 18. ^ Fattah, Hala Mundhir (1997). The Politics of Regional Trade in Iraq, Arabia, and the Gulf, 1745–1900. Albany, New York: State University of New York Press. p. 114. ^ Agius, Dionisius A. (2012). Seafaring in the Arabian Gulf and Oman: People of the Dhow. New York: Routledge. p. 48. ^ Ágoston, Gábor; Masters, Bruce (2009). Encyclopedia of the Ottoman Empire. New York: Infobase Publishing. p. 321. ^ Potter, Lawrence G., ed. (2009). The Persian Gulf in History. New York: Palgrave Macmillan. p. 272. ^ a b c d e Casey, Michael S. (2007). The History of Kuwait. Westport, Connecticut: Greenwood Publishing Group. p. 57. ^ a b c Al Sager, Noura, ed. (2014). Acquiring Modernity: Kuwait's Modern Era Between Memory and Forgetting. National Council for Culture, Arts and Letters. p. 7. ^ a b Al-Nakib, Farah, ed. (2014). "Kuwait's Modernity Between Memory and Forgetting". Academia.edu. p. 7. ^ a b Farid, Alia (2014). "Acquiring Modernity: Kuwait at the 14th International Architecture Exhibition". aliafarid.net. ^ Gonzales, Desi (November–December 2014). "Acquiring Modernity: Kuwait at the 14th International Architecture Exhibition". ^ "Looking for Origins of Arab Modernism in Kuwait". ^ Al-Nakib, Farah (1 March 2014). "Towards an Urban Alternative for Kuwait: Protests and Public Participation". Built Environment 40 (1): 101–117. ^ a b c d "Cultural developments in Kuwait". March 2013. ^ a b Chee Kong, Sam (1 March 2014). "What Can Nations Learn from Norway and Kuwait in Managing Sovereign Wealth Funds". Market Oracle. ^ al-Nakib, Farah (17 September 2014). "Understanding Modernity: A Review of the Kuwait Pavilion at the Venice Biennale". ^ a b c Sajjad, Valiya S. "Kuwait Literary Scene A Little Complex". Arab Times. A magazine, Al Arabi, was published in 1958 in Kuwait. It was the most popular magazine in the Arab world. It came out it in all the Arabic countries, and about a quarter million copies were published every month. ^ a b Gunter, Barrie; Dickinson, Roger, eds. (2013). News Media in the Arab World: A Study of 10 Arab and Muslim Countries. New York: Bloomsbury Publishing USA. p. 24. ^ Sager, Abdulaziz; Koch, Christian; Tawfiq Ibrahim, Hasanain, eds. (2008). Gulf Yearbook 2006-2007. I. B. Tauris. p. 39. The Kuwaiti press has always enjoyed a level of freedom unparalleled in any other Arab country. ^ Kinninmont, Jane (15 February 2013). "The Case of Kuwait: Debating Free Speech and Social Media in the Gulf". ISLAMiCommentary. ^ Muslim Education Quarterly 8. Islamic Academy. 1990. p. 61. Kuwait is a primary example of a Muslim society which embraced liberal and Western attitudes throughout the sixties and seventies. ^ Rubin, Barry, ed. (2010). Guide to Islamist Movements. Volume 1. Armonk, New York: M.E. Sharpe. p. 306. ^ Wheeler, Deborah L. The Internet In The Middle East: Global Expectations And Local Imaginations. Albany, New York: State University of New York Press. p. 99. ^ Osnos, Evan (11 July 2004). "In Kuwait, conservatism a launch pad to success". ^ "Kuwait’s Souk al-Manakh Stock Bubble". Stock-market-crash.net. 2012-06-23. Retrieved 2013-01-14. ^ a b Bansal, Narottam P.; Singh, Jitendra P.; Ko, Song; Castro, Ricardo; Pickrell, Gary; Manjooran, Navin Jose; Nair, Mani; Singh, Gurpreet (eds.). "Processing and Properties of Advanced Ceramics and Composites" 240. Hoboken, New Jersey: John Wiley & Sons. p. 205. ^ "Iraqi Invasion of Kuwait; 1990". Acig.org. Retrieved 28 June 2010. ^ a b Gregory, Derek (2004). The Colonial Present: Afghanistan, Palestine, Iraq. Wiley-Blackwell. ^ "Iraq and Kuwait: 1972, 1990, 1991, 1997". Earthshots: Satellite Images of Environmental Change. Retrieved 2013-01-14. ^ "The Use of Terror During Iraq’s Invasion of Kuwait". ^ "Iraq and Kuwait Discuss Fate of 600 Missing Since Gulf War". Los Angeles Times. Associated Press. 9 January 2003. ^ Selvik, Kjetil (2011). "Elite Rivalry in a Semi-Democracy: The Kuwaiti Press Scene". Middle Eastern Studies: 478. ^ Robert F. Worth. "In Democracy Kuwait Trusts, but Not Much". ^ Selvik, Kjetil (2011). "Elite Rivalry in a Semi-Democracy: The Kuwaiti Press Scene". Middle Eastern Studies 47 (3): 477–496. ^ Ulrichsen, Kristian Coates (2014). "Politics and Opposition in Kuwait: Continuity and Change". Journal of Arabian Studies: Arabia, the Gulf, and the Red Sea 4 (2): 214–230. ^ a b "Kuwait rated ‘partly free’ by Freedom House". Mubasher. ^ "Freedom in the World: Kuwait". Freedom House. 2011. Retrieved 25 June 2012. ^ "Freedom of the Press - Scores and Status Data 1980-2014". Freedom House. ^ "World Report - Kuwait". Refworld. ^ "Kuwait Media Sustainability Index (MSI)". ^ "Kuwait: A Democratic Model in Trouble". ^ "Press Freedom". Since 2005, Kuwait has earned the highest ranking of all Arab countries on the annual Press Freedom Index of Reporters Without Borders. ^ a b "Kuwait Press Freedom". ^ a b "Press Freedom Index 2011-2012". ^ a b "Press Freedom Index 2013". ^ a b "World Press Freedom Index 2014 - Reporters Without Borders". ^ "Press Freedom Index 2006". ^ "Press Freedom Index 2007". ^ "Press Freedom Index 2008". ^ a b "Press Freedom Index 2009" (PDF). p. 2. ^ "Press Freedom Index 2010". ^ "Freedom of the Press 2010" (PDF). p. 25. ^ "Freedom of the Press 2009" (PDF). p. 20. ^ "Freedom of the Press 2008" (PDF). p. 24. ^ "Freedom of the Press 2006" (PDF). p. 15. ^ "Freedom of the Press 2007" (PDF). p. 21. ^ "Freedom of the Press 2005" (PDF). p. 15. ^ Women and Media in the Middle East: Power Through Self-Expression. p. 122. ^ Social Semiotics of Arabic Satellite Television: Beyond the Glamour. p. 120. ^ "Kuwait ex-MPs get jail terms for insulting H H Amir". ^ "Doing business in Kuwait". Practical Law. ^ Tarakji, Ziad (September 2011). "Kuwait Legal Provisions" (PDF). Switzerland Global Enterprise. Embassy of Switzerland. Retrieved 9 September 2013. ^ Nyrop, Richard F. (1985). "Persian Gulf states: Country Studies". p. 80. In addition, Kuwait has established a secular legal system, unique among the Gulf states. ^ a b Hopkins, Nicholas S.; Ibrahim, Saad Eddin, eds. (1997). Arab Society: Class, Gender, Power, and Development (3rd. ed.). Cairo, Egypt: American University of Cairo. p. 417. ^ Maddex, Robert L. Constitutions of the World. Abingdon, UK: Routledge. p. 153. ^ Liebesny, Herbert J. (1974). The Law of the Near and Middle East: Readings, Cases, and Materials. Albany, New York: State University of New York Press. p. 110. ^ "Kuwait, State of". Law.emory.edu. ^ "State of Kuwait, Public Administration Country Profile" (PDF). ^ a b c Price, David (2009). The Development of Intellectual Property Regimes in the Arabian Gulf States: Infidels at the Gates. Abingdon, UK: Routledge-Cavendish. p. 23. ^ Hafeez, Zeeshan Javed. Islamic Commercial Law and Economic Development. San Fabcisco, California: Heliographica. p. 10. ^ a b Yetiv, Steve (1995). America and the Persian Gulf: The Third Party Dimension in World Politics. Westport, Connecticut: Greenwood Publishing Group. p. 51. ^ Panaspornprasit, Chookiat (2005). US-Kuwaiti Relations, 1961–1992: An Uneasy Relationship. Abingdon, UK: Routledge. p. 75. ^ Wallace, Charles P. (20 July 1987). "No Military Bases for U.S., Kuwait Says". Los Angeles Times. ^ "Bubiyan (island, Kuwait)". Encyclopædia Britannica. Retrieved 28 June 2010. ^ "Structurae [en]: Bubiyan Bridge (1983)". En.structurae.de. 19 October 2002. Retrieved 28 June 2010. ^ Pendick, Daniel. "Kuwaiti Oil Lakes". Encarta. Archived from the original on 31 October 2009. ^ "The Economic and Environmental Impact of the Gulf War on Kuwait and the Persian Gulf". American.edu. Retrieved 28 June 2010. ^ "Kuwait (country)". Encarta. Archived from the original on 31 October 2009. ^ "Kuwait: Climate". Encyclopædia Britannica. Retrieved 28 June 2010. ^ Masters, Jeff (15 January 2012). "2012: Earth's 10th warmest year on record, and warmest with a La Niña - New country and territory hottest temperature records set in 2012". ^ Burt, Christopher (22 October 2010). "2012: Hottest air temperatures reported on Earth". ^ "Bright future for Kuwait projects market". MEED Media. 27 November 2014. (subscription required (help)). ^ Al-Kharafi, Naeimah (12 October 2014). "Encouraging social entrepreneurship in Kuwait – Special report". Kuwait Times. ^ Saltzman, Jason (11 November 2014). "Keeping Up With Kuwaiti Connection: The Startup Circuit In Kuwait Is Up And At 'Em". Entrepreneur Middle East. ^ Etheridge, Jamie (27 February 2014). "What’s behind the growth of Kuwait’s informal economy". Kuwait Times. ^ Greenfield, Rebecca (12 July 2013). "In Kuwait, Instagram Accounts Are Big Business". The Wire: News for the Atlantic. ^ Kuo, Lily; Foxman, Simone (16 July 2013). "A rising class of Instagram entrepreneurs in Kuwait is selling comics, makeup and sheep". ^ "Kuwait's booming Instagram economy". kottke.org. 12 July 2013. ^ al-Wazir, Yara (23 August 2014). "How Kuwaitis are Instagramming a business revolution". Al Arabiya News. ^ "Kuwait Investment Authority Profile Page". ^ a b "Kuwait Top Arab Investor Abroad In 2013". ^ "Kuwait fund says more than doubled UK investment in past 10 years". Reuters. 28 June 2013. ^ Macdonald, Fiona (30 June 2013). "Kuwait Wealth Fund Doubles Investments in U.K. to $24 Billion". Bloomberg. ^ Ishigami, Miyoko (22 January 2014). "Kuwait becomes top foreign investor in China RMB market" (Press release). ^ "Kuwait residency cap for expats touches off maelstrom". Gulf News. 1 February 2014. ^ "Kuwait MP seeks five-year cap on expat workers’ stay". Gulf News. 30 January 2014. ^ a b "International Religious Freedom Report for 2007". ^ a b "Nationality By Relegion and Nationality". Government of Kuwait (in Arabic). ^ "The Evolution of U. S.-Turkish Relations in a Transatlantic Context" (PDF). ^ "International Religious Freedom Report". ^ "البهائيون في الكويت 100 منتمٍ... ومحفل يديره تسعة أشخاص" (in Arabic). Al Rai Media. ^ Zubir, S.S.; Brebbia, C.A., eds. (2014). The Sustainable City VIII (2 Volume Set): Urban Regeneration and Sustainability. Volume 179 of WIT Transactions on Ecology and the Environment. Ashurst, Southampton, UK: WIT Press. p. 599. ^ Watson, Katie (18 December 2010). "Reviving Kuwait's theatre industry". ^ Hammond, Andrew (2007). Popular Culture in the Arab World: Arts, Politics, and the Media. Cario, Egypt: American University in Cairo Press. p. 277. ^ Rubin, Don, ed. (1999). "Kuwait". The World Encyclopedia of Contemporary Theatre. Volume 4: The Arab world. London: Taylor & Francis. p. 143. ^ Fattahova, Nawara (26 March 2015). "First Kuwaiti horror movie to be set in ‘haunted’ palace". Kuwait Times. ^ Mansfield, Peter (1990). Kuwait: vanguard of the Gulf. Hutchinson. p. 113. Some Kuwaiti soap operas have become extremely popular and, although they are usually performed in the Kuwaiti dialect, they have been shown with success as far away as Tunisia. ^ a b Grove Encyclopedia of Islamic Art & Architecture: Three-Volume Set. p. 405. ^ Al Qassemi, Sultan Sooud (22 November 2013). "Correcting misconceptions of the Gulf’s modern art movement". Al-Monitor: The Pulse of the Middle East. ^ "Mapping Arab Art through the Sultan Gallery". ^ "The Sultan Gallery - Kristine Khouri". ^ "Khalifa Qattan, Founder of Circulism". ^ "Sheik of the Artists: Khalifa Qattan and Circulism (video project)". ^ 2014 Census shows only three religion categories: "Muslim", "Christian" and "Other". Reasonably assuming majority of "Other" Kuwaiti citizens is Bahá'í. Abu-Hakima, Ahmad Mustafa, ed. (1983). The Modern History of Kuwait: 1750-1965. London: Luzac & Company. Abu-Hakima, Ahmad Mustafa, ed. (1965). History of Eastern Arabia, 1750-1800: The rise and development of Bahrain and Kuwait. Bahrain: Khayats. Tétreault, Mary Ann, ed. (2000). Stories of Democracy: Politics and Society in Contemporary Kuwait. New York: Columbia University Press.